The post-college, pre-kids stage is a time when friendships feel crucial. Especially since I'm living in a separate state from my family, I rely on my friends (and boyfriend, but that's for another time) for the day-to-day social interactions and trouble-shooting. Over my time in New York, my friends have accompanied me to various doctor's appointments that have felt scary, and I have done the same for them. Yes, we are adult women who are perfectly capable of going to the doctor's on our own. That isn't the point; the point is that we are there to support each other through the parts of life that are happy and exciting of course, but also scary and upsetting. This was the case when a friend of mine went to get her first IUD implanted (for more information on this amazing little device, check out Planned Parenthood's awesome guide here). Perfectly normal, typical appointment - still kind of scary. So off we went to her gynecologist, and while she was with the doctor I did what I normally do when I have time to kill and have forgotten my book: prowl Pinterest. As I scrolled down my feed full of cats and black lipstick, a post about vegan corn chowder popped up. Now, I must admit - everything about chowder, including the very word chowder, kind of freaks me out. Like, why are there creatures in there? Why does the word chowder remind me of that horrific scene in Drop Dead Gorgeous at the hotel? Who knows. I decided to click the link, however, and I am SO glad I did. This recipe is phenomenal. PheNOMenal. It's adapted from Crazy Vegan Kitchen, where you can find even more amazing vegan recipes. 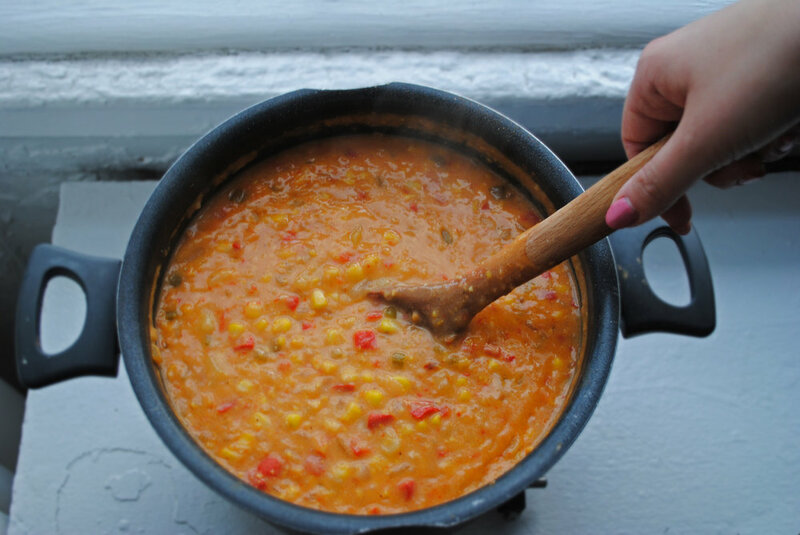 It is everything you would want in a soup: filling, hearty and full of corn and potatoes. Maybe that last part is just me. Since discovering this recipe, I have made it countless times for the people who love and support me: I make it for shabbat dinners, I make it for date nights while drinking copious amounts of white wine, and I make it for myself when all I want is a big warm bowl of soup (you have to love yourself, too!). At these meals we talk about everything, from the political landscape and birth control, to Jewish law and culture, to Beyonce and what lipstick we're all wearing. I encourage you to make this soup for the ones you love (including you!) - there's never been a better time to be kind to each other. *I will put tons and tons of garlic into everything I eat, so 3 cloves is an amount that seems normal for most humans. Put as much or as little as you like, or omit it completely. No one will judge you if you blackout and come to with 8 cloves of garlic in your soup. **I love Yukon golds, but russets work just as well. ***To make this gluten-free, just sub gluten-free flour. Heat your glug of olive oil in a medium-large soup pot. I tend to err on the side of a bigger glug since it's delicious and we have a whole lot of vegetables to sautee, but use the amount that best suits your preferences. Meanwhile, prepare your vegetables. 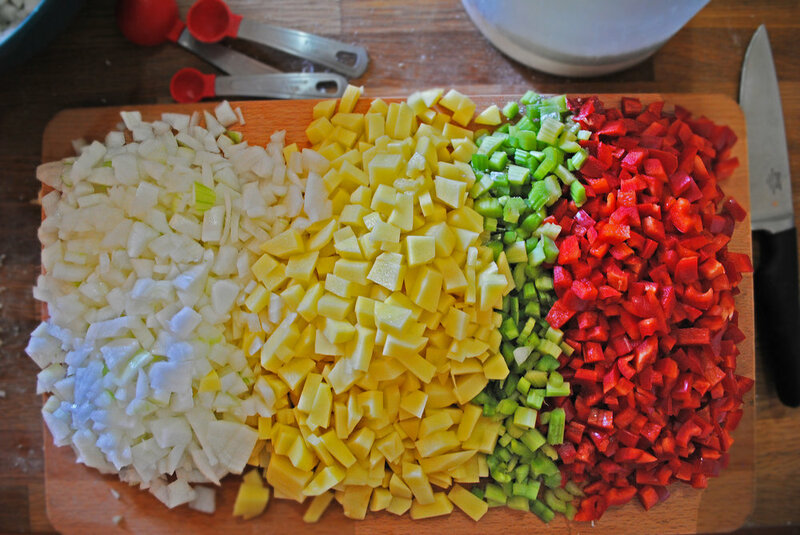 Dice your onion, celery and pepper. Try to make sure the pieces are all even in size, but no need to break out the ruler. Add the onion first, let it sautee for a couple of minutes, and then add the celery and pepper. Mince your garlic while this sautees and starts to make your house smell heavenly. Make sure to stir every once in a while so that nothing burns. Dice your potatoes. 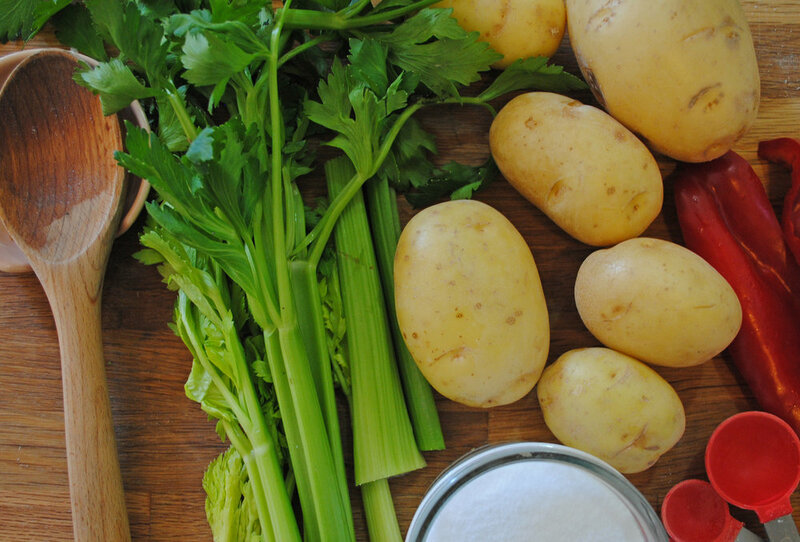 Like your other veggies, dice your potatoes (skins on or off is up to you, I skin mine). Once your Southwestern mirepoix looks softened and glistening, add the potato. Cook this mixture for about 5 minutes, and then add the flour and stir well. Let cook for 3 minutes. Add the non-dairy milk of your choosing and vegetable broth. Stir the soup and scrape the bottom so that nothing is stuck. Bring to a boil, then reduce to a simmer for 20 minutes. Before you cover the soup with a lid (or baking pan, we're all doing the best we can), add your spices in, including the salt and pepper. For your salt, always err on the side of less and add more in if you think the soup needs it. It's super easy to add more salt to a soup, not so much for the reverse. While your soup cooks, this is a great time to get things done. Clean your kitchen, make your bed, respond to those pesky emails, look at cat videos. This is you time. After 20 minutes, add your corn and simmer for another 15-20 minutes. Make sure your potatoes are fully cooked through. Potatoes are sneaky sometimes. Once the soup is done cooking, transfer 1/4-1/3 of the soup to a blender or food processor. How much you put in is totally dependent on how thick or thin you want your soup to be. You can also do this with an immersion blender - a few quick pulses should do the trick. This gives the soup its awesome texture. Put all of the soup back in the pot, and add the apple cider vinegar, hot sauce and honey (if you'd like). Sriracha and red pepper flakes are great options for this soup, and the honey is a good way to balance out the slight sourness and savoriness of the soup. Not always necessary, and you should definitely taste your soup before you add it to see if it needs some. To serve: fill up big bowls, whip out your favorite bread, and get to spooning. If you're in a fancy mood, some chopped green onion with extra bits of corn and red pepper make a nice garnish, but this soup alone is enough to impress. I like to top mine with a hefty dose of Green Dragon Sauce from Trader Joe's (not sponsored, but good lord is it delicious).